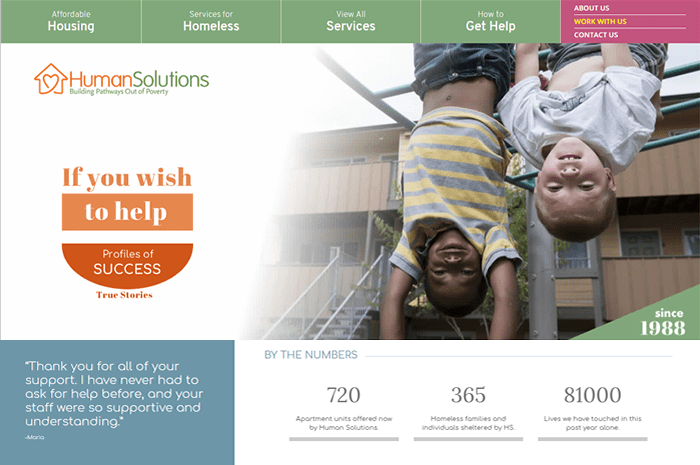 The new Human Solutions website is an upgrade from what we had created for them in 2015. Since that time, we found that the top visited pages: Affordable Housing, Services for the Homeless, Overview of Services, and How to Get Help, needed to have a greater presence. 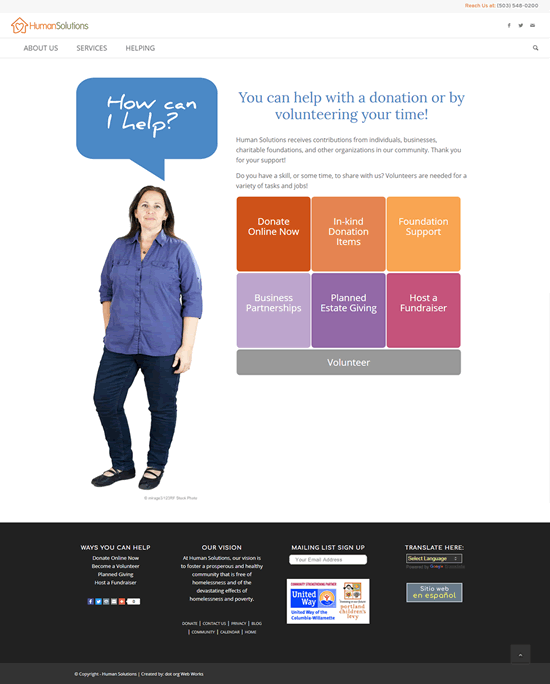 Additionally, the client wished to better promote their organizational successes and raise their helping/donate options (including a stepped-up “Ambassador Board” page). This within a warmer color palette. 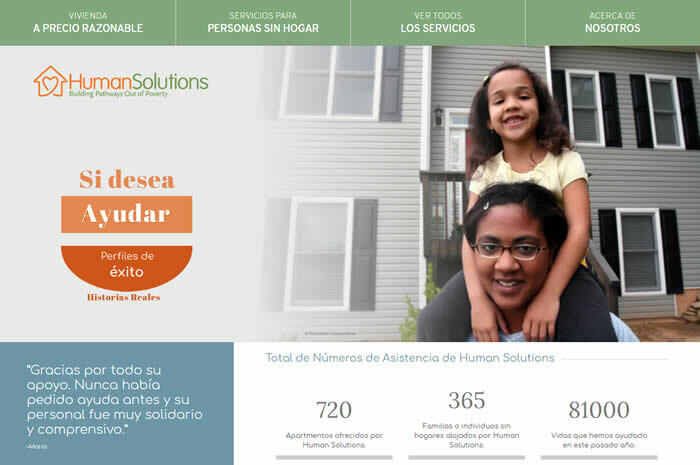 Lastly, they wanted all pages to have a translation option, with 3 key pages in Spanish, and that the mobile device view of the Home pages (both English and Spanish) to be lean and focused more toward the needs of the clients. All this was in addition to the priorities set and displayed within the 2015 version. 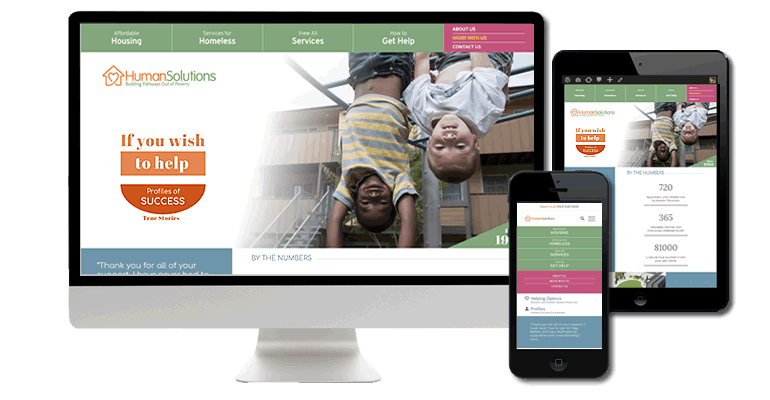 We rebranded the Home page to be more focused on the organization’s success and helping options, and prioritize the top visited Pages: Affordable Housing, Services for Homeless, Overall Services, and How to Get Help. This was achieved by positioning these service priorities at the very top of the website using large, priority, buttons. The organization’s success has been further developed to include a freshly designed Profiles of Success section, and dynamic milestone “numbers” on the Home page. 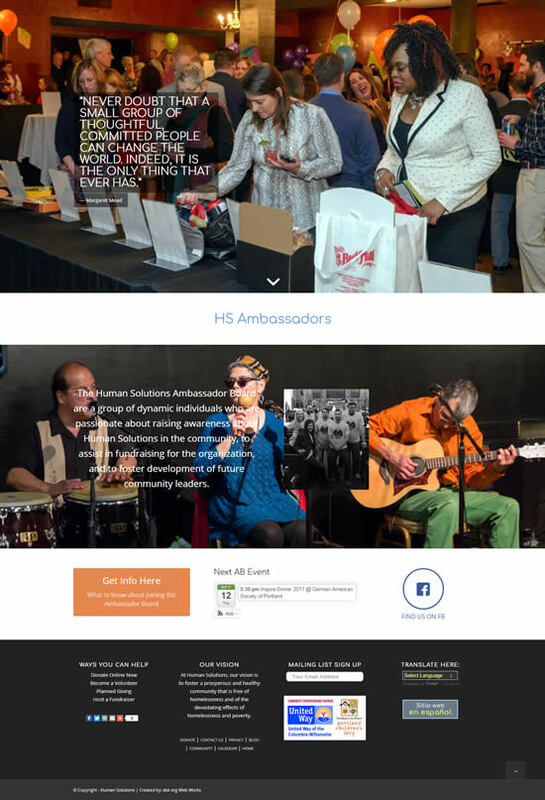 To attract more of the organization’s “millennial” supporters, the Helping Options and Ambassador Board pages were rebranded, and the website gained a warmer color palette. Moreover, Google Translate was added to all pages, with 3 additional pages created specifically for the Spanish speaking viewers. These new, manually translated pages, are: Home, Services and About Us. And, the mobile view for all pages, especially the Home pages (English and Spanish) have been branded with client needs as the first priority.